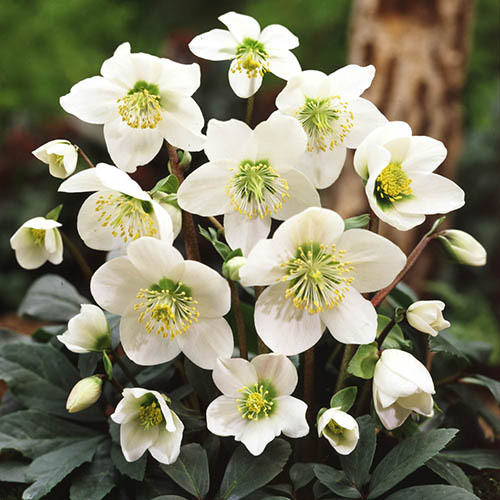 Purest white long-lasting single flowers, the 'Christmas Rose' flowers for much longer than that! Use indoors in Winter in flower, then plant outside for many years of Winter colour. Ht to 30cm. Abundance of truly beautiful bowl-shaped, snowy-white flowers, which turn pink as they age. They thrive in any garden setting - in pots or borders - especially in shadier spots, and are very easy to grow. Brighten up the darkness of winter with these gorgeous Christmas Roses! Helleborus niger is one of the most popular Hellebore varieties across the world, and it is easy to see why. And it has been improved by plant breeders with the introduction of this new variety 'Christmas Carol', with many more flowers and a much longer flowering season. Each plant will produce an abundance of truly beautiful bowl-shaped, snowy-white flowers, which turn shades of pink as they age, across the festive period and beyond, year after year. They have lovely, thick, dark-green leaves and foliage too. Perfect for displaying indoors they will make a magical centrepiece, when put in a decorative pot or wrapped in some festive wrapping paper! After, plant them out in your garden they are completely winter hardy and will last for years, with displays coming back bigger and better each year.